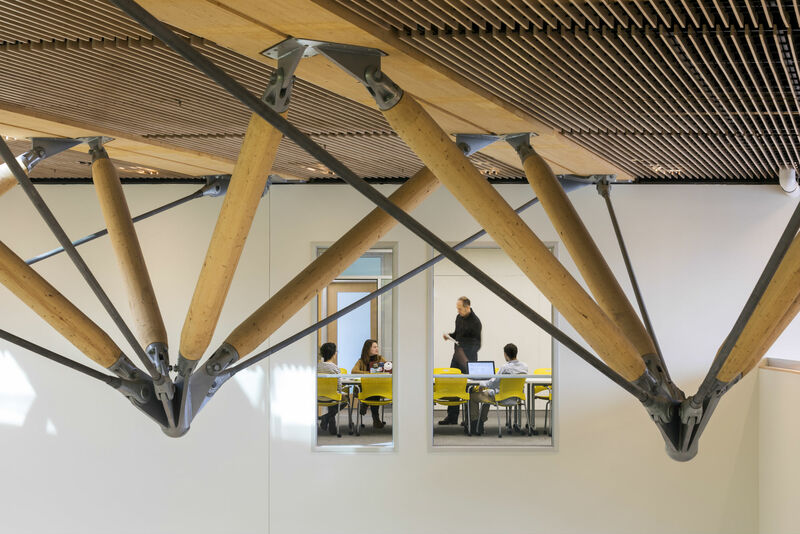 Leers Weinzapfel Associates recently completed construction on the first academic building in the US to use a cross-laminated timber (CLT) structure. 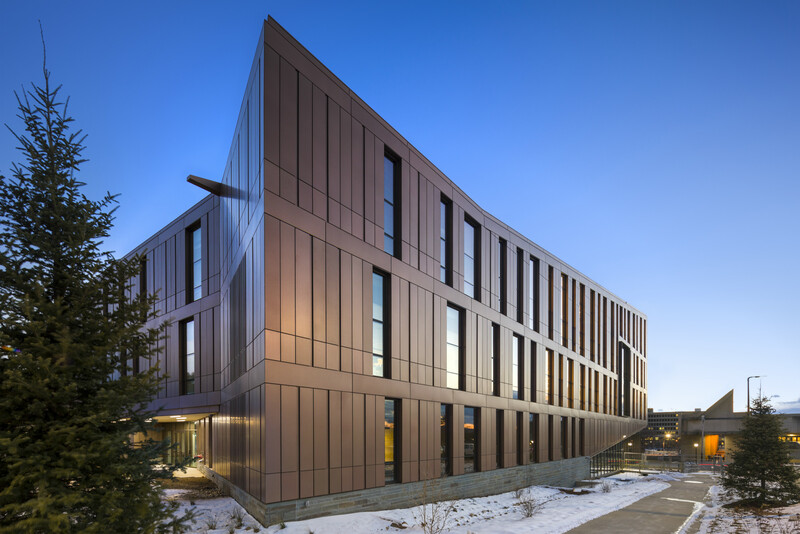 Boston-based Leers Weinzapfel Associates recently completed construction of the new Design Building at the University of Massachusetts Amherst, the first academic building in the U.S. to use a Cross Laminated Timber (CLT) as its primary structure. 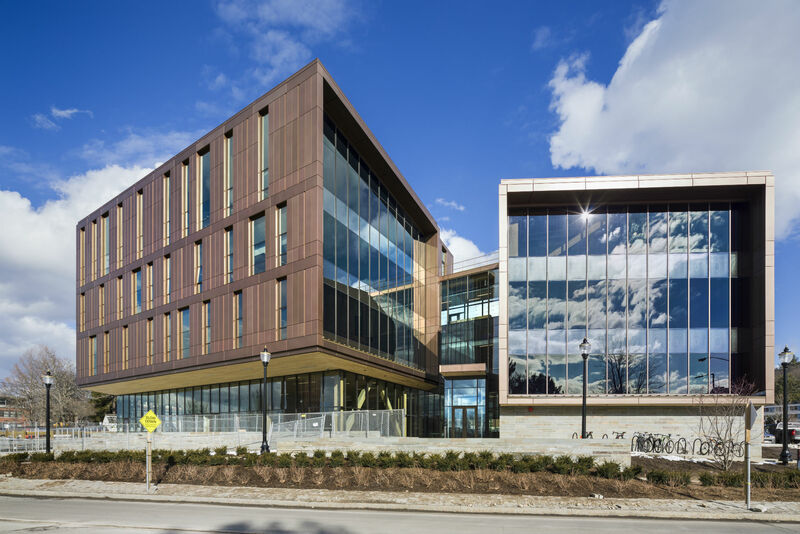 (See images of the building under construction here.) 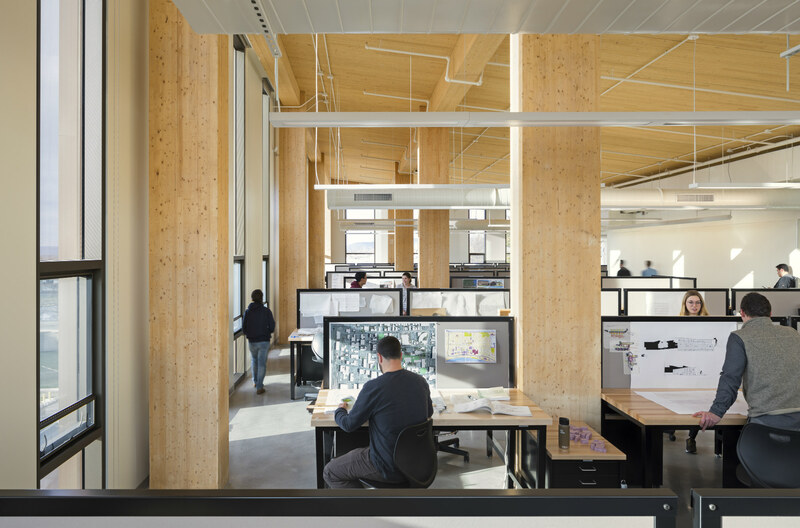 Targeted for LEED Gold, the building includes other sustainable architectural features like bio-swales for water runoff filtration, a green-roof which doubles as an outdoor classroom, and the largest installation of wood concrete composites in North America. 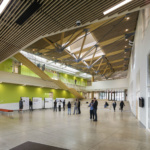 The building is organized around an interior atrium lit during the day by several skylights. 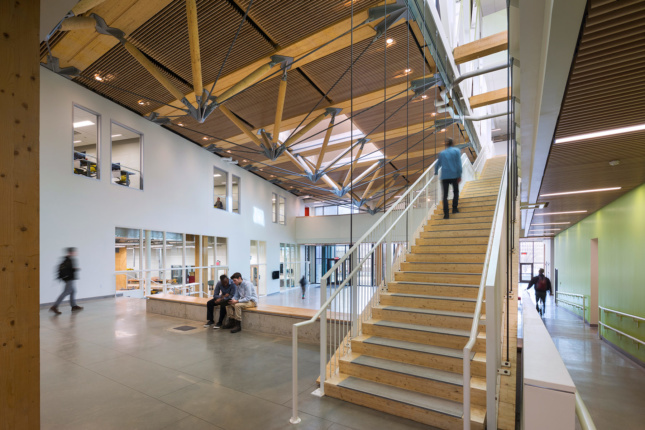 This daylighting strategy reduces energy consumption and provides the school with a bright central space for exhibitions, design critiques, lectures, informal gatherings, and other events. 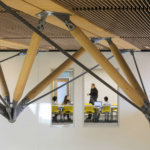 The studios and classrooms are arranged around the atrium, visually connected to the commons through window apertures that allow visitors to glimpse the work being done by the students and faculty. 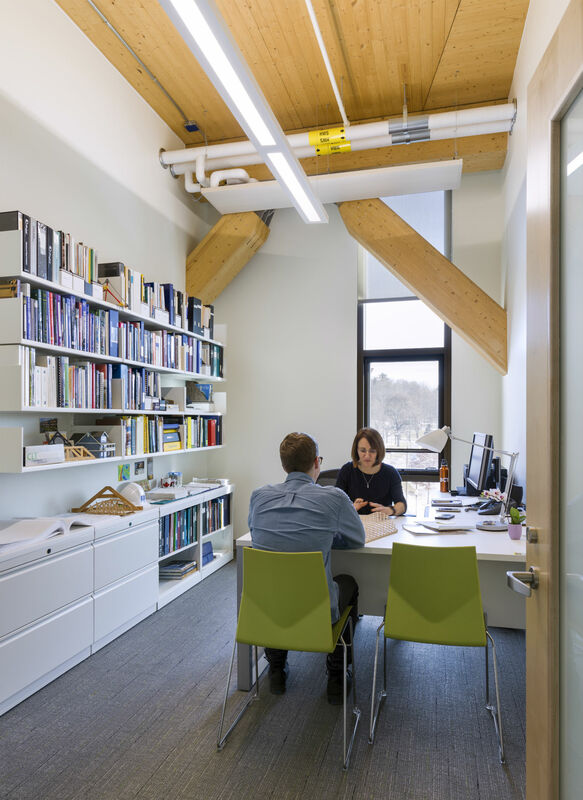 The design of the building’s commons also emphasizes the unification of the university’s departments of Architecture, Landscape Architecture and Regional Planning, and the Building and Construction Technology program into one singular facility. 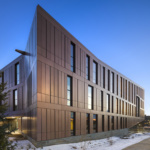 In addition to its extensive use of wood products, the architects chose to clad the building with copper-finished aluminum panels that protect the highly-efficient envelope. 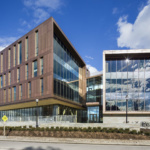 Though the building fills much of the site, the landscape design by Stephen Stimpson Associates strategically uses native plants and local paving materials to connect the building to the larger campus. 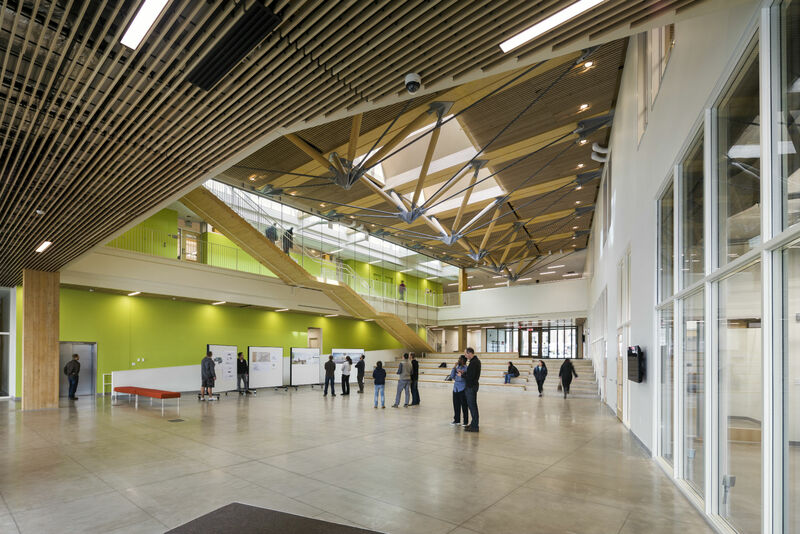 In the end, the building cost $52 million to construct, a price tag that was partially funded by Massachusetts State Legislature, and adds 87,500-square-feet of additional interior space to the university. Suffolk was the construction manager.